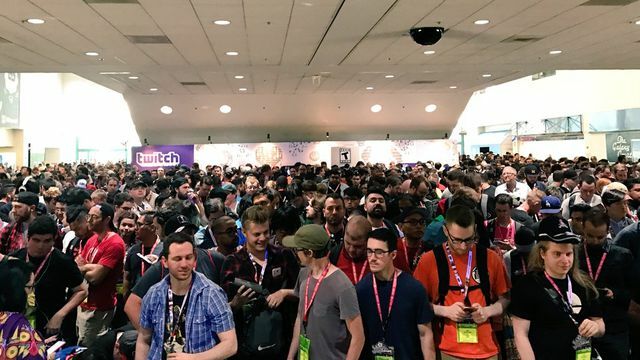 The largest crowds seen for E3 at the Los Angeles Convention Center forced it to open doors 15 minutes early to keep the situation from becoming hazardous, according to several tweets from industry figures. This is the first time E3 has been open to the public. The Entertainment Software Association, which manages the event, sold 15,000 tickets granting three-day access to the expo. Ordinarily, it has been an event for industry, retailers and press covering the subject. A spokesman for the Los Angeles Fire Department told Polygon that there were no LAFD units at the scene and no hazards or incidents it was aware of. LAFD inspectors are on site to routinely monitor crowd size and flow. Polygon reached out to an ESA representative for comment about the early opening and the hazard created by the crowd, and whether the ESA and Los Angeles Convention Center staff have plans for tomorrow's opening. A reply was not received as of publication time. The ESA told Polygon last week that, although it had sold tickets to 15,000 newcomers, it cut down on the number of qualified passes given to industry and media. "You'll see an increase in the number of people," Rich Taylor, the ESA's senior vice president of communication and industry affairs, told Polygon, "but probably not by 15,000 though." Even with the early opening, the clot of expo-goers at the doors — and the need to check their badges — kept many far away from the entrance past opening time. Polygon writers on scene said the crowd is by far the largest seen for an E3 at the LACC. "The show floor is flooded with people, it's more packed than I've ever seen it," said Justin McElroy. "Worse, I suspect because no one has appointments, everyone is just kind of wandering aimlessly as they stare at the spectacle."